Fife brewery and distillery Eden Mill has released a limited edition single malt in celebration of St Andrew’s Day today (30 November). Just 3,200 bottles of the no age statement single malt have been produced as the first instalment in what will become an annual series. The Eden Mill 2018 St Andrew’s single malt is a vatting of whisky distilled from Golden Promise and Propino barley matured for ‘three to four years’ in a selection of cask types, including ex-oloroso Sherry hogsheads, ex-Bourbon barrels, and ex-Sherry octave casks. Bottled at 46.5% abv, it’s described as having ‘sweet and juicy notes of peach and plum’ with a ‘light fruitcake character’. The bottling is the second single malt from Eden Mill, whose inaugural First Release was launched in May this year. 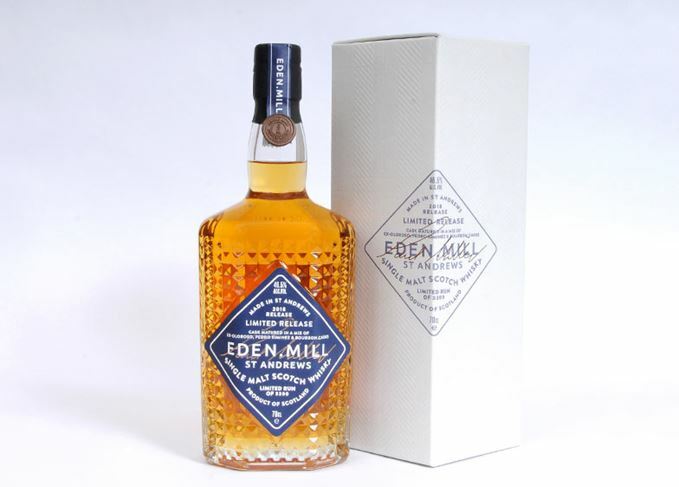 The first 200 bottles were gifted to Eden Mill employees, or auctioned online, with bottle number one breaking the world auction record for the highest price paid for a single bottle from a new distillery, when it sold for £7,100. Of the 3,200 bottles of Eden Mill 2018 St Andrew’s malt released, around 2,000 will be available to purchase in the UK from select retailers for £79. A special delivery of the bottles was made earlier today via a convoy of Rolls Royce Phantoms to two St Andrews hotels, The Old Course and the Fairmont. All the recipes and whisky advice you could possibly need to host your own St Andrew’s Day feast.